The right of nations to determine their own fate free of foreign interference or external coercion is a rightly cherished and – through the anti-colonial struggles of the 20th century by the people of Syria and many others – a hard-won democratic principle. This democratic principle is not operative in Syria today because there already is massive foreign interference and external coercion – not by the U.S. but by Iran, Hezbollah, and Russia. Assad is propped up by foreign bayonets, boots on the ground, and money while the opposition relies on primitive, homemade weaponry because the ineffectual arms they receive intermittently from Saudi Arabia and Qatar are hardly effective at countering Assad’s continually renewed supply of tanks, planes, and heavy artillery. Add to that the multiple Israeli airstrikes that went completely unopposed and unanswered and we can see that U.S. airstrikes and/or stepped up military aid to the opposition will not violate a non-existent sovereignty and the inoperative democratic principle that underlies it. In these debates, the I- and the E-words are generally used as pejoratives rather than as scientific or descriptive terms that could shed light on the question of U.S. military intervention into the Syrian civil war. Simply identifying the U.S. as an imperial or imperialist power says nothing about whether a given policy or action is good or bad, worthy of support or deserving opposition. Of course, most self-described anti-imperialists oppose any and every military move of imperialist powers as a matter of principle, one that applies irrespective of time, place, history, context, or circumstance. From the sound premise that imperialism is bad, they draw the absurd conclusion that imperial powers can only do bad things, so whether they arm tyrants like Saddam Hussein and Francisco Franco or freedom fighters like Ho Chi Minh or America’s Founding Fathers makes no difference; for them, all of these imperial interventions were equally bad for humanity and deserved to be opposed. For this crowd, U.S. military intervention in foreign conflicts is about the nature and character of the U.S. and its role in the world rather than the nature and character of the conflict the U.S. becomes party to. This “it’s not you, it’s me” approach to other people and their wars has been correctly described as narcissistic, as if America’s national mirror is the right tool for reflecting on Syria and what to do about it. This ostensibly civilian-centered perspective is anti-war in form but pro-war in essence since “sometimes you have to pick the gun up to put the gun down,” as Malcolm X said. Seventy years ago, Jews in the Warsaw ghetto picked their guns up to put the Nazis’ guns down by staging an uprising as Adolf Hitler began exterminating the Jewish population of Europe with chemical weapons. Jewish leaders and the Warsaw ghetto’s fighters begged Allied governments to do something, anything, to alleviate their plight, but the Allies turned a deaf ear to their cries and stuck to their cruel “hands off” do-nothing policy. Like World War Two, Syria is a rare case where the only way to peace is through war, where the only way to save lives is to take lives, and this truth has nothing to do with the tired Hitler-Assad analogy or Orwellian doublethink. 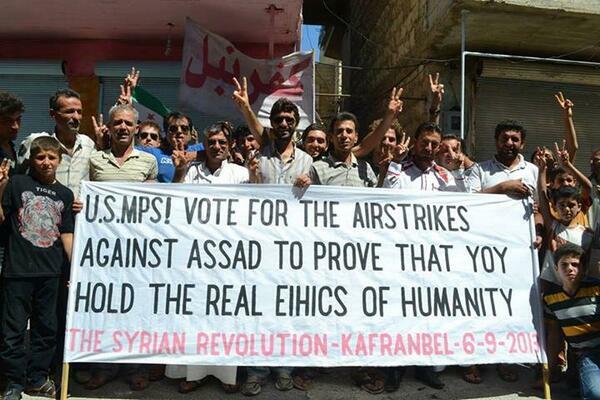 The only way to save lives in Syria is to bring down the regime that is snuffing them out by the thousands. Ask any veteran of the French, Italian, Greek, or Yugoslav resistance movements if the Allied bombing campaigns against fascist forces made bad situations worse. Ask them if putting the Nazis’ guns down would have been possible without picking their guns up in conjunction with the guns of Allied governments. Malik Little is an activist and writer. You can find him on Facebook. Yes, when it comes to dealing with the murderous Assad regime, Malcolm X’s assertion that “sometimes you have to pick the gun to put the gun down,” cannot be more pertinent. Indeed, any argument against military intervention in Syria to put an end to the criminal regime is in effect an implicit complicity in the deliberate killing of the Syrian people as well as the systematic destruction of the priceless heritage of Syria. About imperialism: One might consider the Vietnamese invasion of Cambodia in 1979 as “imperialist” in a sense. I could be argued that it was self-defense or retaliation as well. True, the Vietnamese didn’t invade Cambodia to stop the murderous regime of Pol Pot from committing crimes against humanity in a massive scale, but to stop its attacks on Southern Vietnam, so that hardly amounts to a “humanitarian intervention”, and Vietnam turned Cambodia into a sort of satellite state for years to come, but the truth of the matter is that, regardless of Vietnam’s goals and intentions, the invasion overthrew the Khmer Rouge regime and stopped one of the worst genocides in history (and it’s likely that the Khmer Rouge wouldn’t have survived afterwards without the help of China, Thailand, the US or the UK, but that’s a different story). I’m not defending a US intervention in Syria, which I would oppose, albeit for different reasons to those shown here, and it seems that it is not going to happen anyway. My point is that the intentions of an intervention don’t need to be “pure” to render such intervention effective from a humanitarian point of view. What are your arguments re: Syria? I’m not by any means an “expert” in the Middle East and, honestly, I don’t think my opinion on this has any value whatsoever, so I must confess that I don’t have a clear position, just lots of doubts. But here I go: I think that if the US intervened, it wouldn’t have any clue of what to do once inside Syria, as it has demonstrated in any single intervention in recent story. That’s basically my argument. Going back to the Cambodian example, the Vietnamese knew well what they were doing and they had local allies powerful enough (Heng Samrin and Hun Sen). But most probably Syria is more intractable than Cambodia was (there are more factions, not a unified leadership among the rebels, and so on). On the other hand, it seems that the US doesn’t really want to topple Assad and that a war without end confined to Syria serves its interests (and Israel’s) perfectly well. Anyway, the war in Syria is so terrible and the Assad regime violence against civilians so extreme that is difficult to see how a foreign intervention would worsen a situation on the ground which is already as bad as it can be imagined. Sounds like you’re talking about an invasion (“inside”) rather than airstrikes, which would presumably mean the U.S. military stays on the outside. I think it’s important to un-conflate different types of intervention — arming the Free Syrian Army, attacking Assad’s airfields, and sending 250,000 Americans into Damascus are not at all the same things.